It has become clear that our elected representatives in the Northwest are not doing all they can to save the salmon and orcas that we all love and cherish. 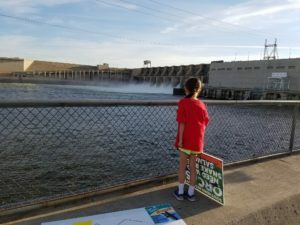 We’ve asked them time and again to contact the Army Corps of Engineers in DC and request that the Corps breach the 4 deadbeat lower Snake River dams that are returning a benefit of $0.15 for every taxpayer and ratepayer dollar spent and are on the verge of causing the extinction of Snake River salmon and steelhead. Since our elected officials are not acting, let’s contact the Corps ourselves. In the “Recipient” drop down box, choose “Civil Works”. For the subject put “4 Lower Snake River Dams”. For the message, we’ve written a example below that you can copy and paste into your browser. Feel free to personalize the message, but please be respectful. Please take immediate action to commence breaching of the 4 lower Snake River dams. The Army Corps of Engineers has a fiduciary responsibility to end projects not providing a favorable cost:benefit ratio for US taxpayers. Snake River salmon are not recovering and are in fact headed to extinction. Salmon are a keystone species and their demise will certainly lead to further ecosystem collapse in the Northwest and a breach of Native American treaty fishing rights. The Corps shamefully ignored its own predictions in the 2002 FR/EIS Summary (pg 25) that fish transport and system improvements would do less for fish recovery than doing nothing at all. And you ignored your own research that said bypassing the 4 lower Snake Dams was the best option for recovery. Since that time, the government has spent $1 Billion and the salmon are in a worse condition than 14 years ago. This is your opportunity to leave a positive legacy for the US Army Corps.